Globe Trotting Video Slot Guide & Review - Casino Answers! Globe Trotting is a 5-reel, 20-line video slot developed by Random Logic, featuring a wild symbol and two bonus games. You can play the Globe Trotting video slot at Bovada. Bets on the Globe Trotting slot machine are $0.05, $0.10, $0.25, $0.50, $1, $2, $5 and $10 per line. You can select 1-20 paylines per spin on the Globe Trotting slot game. You can bet as little as a nickel on the Globe Trotting nickel slot up to the maximum total bet of $200 per spin. Globe Trotting has a wide betting range, suitable for all different types of slots players. You can play the Globe Trotting video slot by selecting your bet and pressing the “Spin” button. Alternatively, you can use “Max Lines” to ensure you are playing the maximum number of paylines. Globe Trotting’s highest paying symbol is the Postcard symbol. 5 Postcard wild symbols on a payline will pay out the 12,000 coin top jackpot. The Postcard wild symbol will substitute for all symbols on Globetrotting, except for the scatter and bonus symbols. The Airplane symbol is the next highest paying symbol at 3000 coins for 5 symbols. 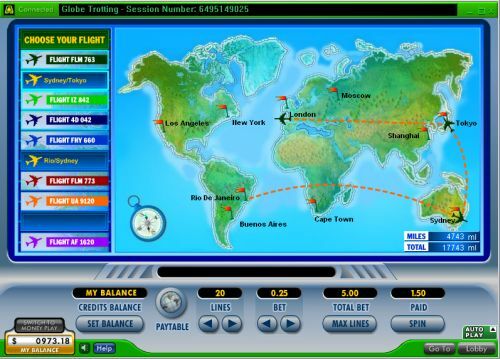 When 3 Globe bonus symbols appear on reels 2, 3 and 4 of an active payline, you will trigger the Jet Set bonus game on the Globetrotting slot game. You will have up to 4 flights to reach the most luxurious highest paying destination out of the ten different choices you will have. You can win big and have fun when you play the Jet Set bonus game at Bovada! All symbols pay left to right on consecutive reels, except for the scatter and bonus symbols. All wins are multiplied by the bet per line, except for scatter wins, which are multiplied by the total bet. Only the highest win is paid on each of the active paylines. Scatter and bonus wins are paid in addition to payline wins. Globe Trotting has a simple autoplay mode found near the bottom-right of the game screen. You can type in from 1-99 autoplay spins. When you have selected your number of spins, press either “Spin” or “Max Lines” to spin the reels. You can stop autoplay on the Globe Trotting online slot at any time. Globe Trotting is missing some regular video slot features that players are used to, but it has two bonus games and a 12,000X top payout that should more than make up for any shortcomings. You can play the Globe Trotting online slot game for real money by signing up and making a deposit at Bovada! Are American players able to play the Globe Trotting slot machine for real money? No, players based in the United States cannot play the Globe Trotting slot game for real money. For an excellent alternative, we recommend you read our Spin the World CTXM Slot Review or play it at Bovada.